Miranda Green » All Dogs Aboard! It may be a long wait at the station for animal lovers hoping to hop a train with their favorite pet. Amtrak won’t permit pets to board the way commercial airlines do. Congress wanted to change that with the Pets on Trains Act, introduced in May. The bill, which would require Amtrak to allow domesticated cats and dogs aboard trains for a fee, has few critics and the support of pet owners everywhere, as well as significant pet lobbies, including the Humane Society. Still, the legislation has little chance of passage within the next year. “In a normal setting, something like this that doesn’t have a strong variant opposition, you could just put in [the transportation reauthorization bill], and it’s going to pass because it’s a reauthorization and it just sails through and everything is fine,” says California Republican Rep. John Campbell, the bill’s co-sponsor. Campbell, along with three other congressmen, pushed the legislation as a mutually beneficial measure for pet owners and Amtrak. Owners would have the option of traveling with their pets aboard specially designated train cars and financially challenged Amtrak would be able to increase revenue by charging a fee for the service. Animals that could fit in a pet carrier and be stowed according to train guidelines would be eligible for travel. 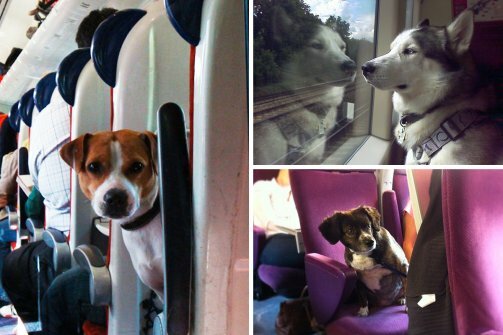 Dogs on Amtrak: Yay or Nay? The Humane Society of the United States is an advocate for the legislation. They argue that any measure that makes it easier for a pet owner to care for their pet, benefits an animal’s well being. Owners would have the option of traveling with their pets aboard specially designated train cars. Financially challenged Amtrak would be able to increase revenue by charging a fee. But Congress’s inability to compromise on even typically bi-partisan issues like transportation, has thrown a wrench into passing the much-anticipated legislation. According to Campbell, during a typical legislation year, the Pets on Trains Act would get adopted by the House Transportation and Infrastructure committee. The Committee would clean up the bill and consider it as an amendment to a broader transportation reauthorization bill currently known as the Moving Ahead for Progress in the 21st Century Act. But with recent party-line disagreements over how to deal with decreased revenue from the gas tax, it may be easier for Congress to extend the current transportation bill instead of changing it. And we won’t know what they decide to do until the current bill expires in September 2014. A wait may be a hard pill to swallow for pet owners, especially since a significant number of Americans prefer to travel with their animals than leave them at home. Asurvey compiled by Trip Advisor found that 44 percent of those questioned planned to take a trip with animals in tow in the coming year and 77 percent had done so in the past 12 months. A significant number of pet owners also feel guilty for leaving their friends behind on trips. A study done by DogVacay.com found that 64 percent said they experienced huge challenges when making travel accommodations for their pets and 73 percent of pet owners asked felt guilty about leaving their animals behind and putting them in pet boarding. It doesn’t look like trains will be alleviating that guilt any time soon. So for now, pet owners are left with nothing but hope and kennels.